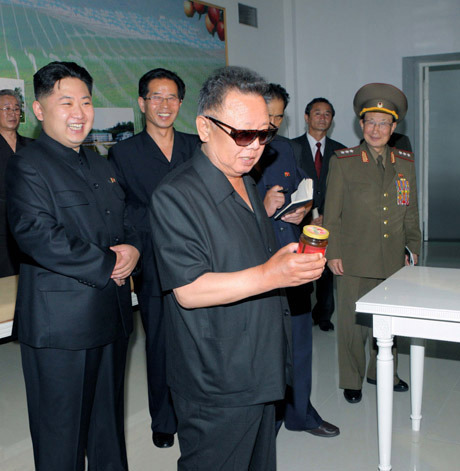 I’ve been fascinated by North Korea’s late Dear Leader Kim Jong-il for a while now — not just because he liked to look at things or because he died, although many people agree that those were two of his more positive qualities. 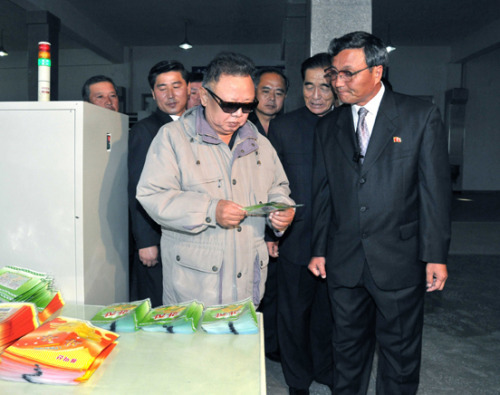 Kim Jong-il looking at a leaflet. The reclusive state that he, and his father before him, maintained affected the development of the Korean language in the North by setting forth new standards (via official pronouncements in 1964, 1966, and 1987), which solidified differences between the Seoul and Pyongyang dialects. And while general daily vocabulary is based on a pre-partition standard, South Korean uses a lot of foreign borrowings from languages like English, whose influence is all but absent in the North. I was also surprised to learn that Kim Jong-il was born in Siberia with the name Yuri Irsenovich Kim. I couldn’t find any information about that discrepancy, so I did a little sleuthing. Korean naming conventions place the family name (here, Kim) at the beginning of the name. The name 김, Kim (pronounced /kim/, often mistakenly heard as “gim” because the /k/ is unaspirated) is the most common surname in Korea, with nearly 22% of Koreans named Kim. The name is derived from the Chinese hanzi (called hanja in Korean) 金, jīn, which means gold. In fact, nearly all popular Korean names derive their meaning from Chinese, and are often written in hanzi as well. Kim Jong-il named his sons using a generational name, keeping the character 정 jeong in all of them — Kim Jong-nam, Kim Jong-chul, and finally Kim Jong-un (the current Supreme Leader), although he didn’t do the same for his eldest child, a daughter, Kim Sul-song. Kim Jong-il’s father, Kim Il-sung, kept the character 일 il in his son’s name. That all does little, of course, to illuminate Kim Jong-il’s Russian name, Yuri Irsenovich Kim. For that we turn to the Slavs, whose naming conventions differ widely from the Koreans. Who is Kim Ir Sen? Russians place the family name (Kim) at the end. For males, the second name is a patronym, which means that it’s derived from the father’s name. If Yuri’s father’s name was Ivan, then his second name would be Ivanovich, like cosmonaut Yuri Ivanovich Malechenko. If Vladimir’s father’s name was Vladimir, then his second name would be Vladimirovich, like Russian President Vladimir Vladimirovich Putin. So this means that Kim Jong-il’s father’s name was Irsen, right? Right. What a happy brutal autocrat! The border between the liquids /l/ and /ɾ/ is frail in Korean, and a word spelled using /l/ can be pronounced as /ɾ/ depending on its position between vowels or at the end of words. However, the “l” in Il-sung is not located in one of those places. Instead, the Russian transliteration of Il-sung as Ир Сен Ir Sen seems to be a sound change that occurred in Russian, not Korean. I’m not familiar with Russian phonology, so maybe somebody can explain in the comments why his name is spelled with “р” r, not “л” l.
The name “Yuri” is derived from the Greek word γεωργός geōrgos, which roughly means farmer. It’s unlikely that naming Kim Jong-il “Yuri” was an attempt to translate “Jong-il” into Russian, because the component parts of Jong-il translate into “straight” and “day.” Maybe Kim Il-sung just really liked the name Yuri for his son. Yuri is a nice name, although if Kim Jong-il had kept it, he probably would have been teased on the playground — Yuri (유리, transliterated yuli but pronounced /ju:ɾi/) is a girl’s name in Korea. And nobody — nobody — teases the Dear Leader. Yuri Kim looking at jam.